Thats great….but as sure as the sun will rise tomorrow, they will claim poverty on our next round of bargaining. 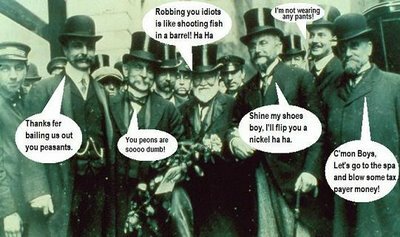 Robber Baron – A term applied to a businessman in the 19th century who engaged in unethical and monopolistic practices, wielded widespread political influence, and amassed enormous wealth. Union Pacific Corporation (NYSE: UNP) today reported 2014 third quarter net income of $1.4 billion, or $1.53 per diluted share, compared to $1.15 billion, or $1.24 per diluted share, in the third quarter 2013. Diluted earnings per share of $1.53 improved 23 percent. Operating revenues totaled $6.2 billion, up 11 percent. Operating income totaled $2.3 billion, up 19 percent. Operating ratio of 62.3 percent improved 2.5 points. Quarterly freight revenue increased 11 percent compared to the third quarter 2013, driven by volume growth and core pricing gains. Union Pacific’s operating ratio of 62.3 percent was an all-time quarterly record, 2.5 points better than the third quarter 2013 and 1.2 points better than the previous all-time quarterly record set in the second quarter 2014. The average quarterly diesel fuel price of $3.01 per gallon in the third quarter 2014 was down 5 percent compared to the third quarter 2013. Quarterly train speed, as reported to the Association of American Railroads, was 23.8 mph, 10 percent slower than the third quarter 2013. The Company repurchased more than 8.3 million shares in the third quarter 2014 at an average share price of $102.54 and an aggregate cost of $856 million. Union Pacific Railroad is the principal operating company of Union Pacific Corporation (NYSE: UNP). One of America’s most recognized companies, Union Pacific Railroad connects 23 states in the western two-thirds of the country by rail, providing a critical link in the global supply chain. From 2004-2013, Union Pacific invested approximately $30 billion in its network and operations to support America’s transportation infrastructure. The railroad’s diversified business mix includes Agricultural Products, Automotive, Chemicals, Coal, Industrial Products and Intermodal. Union Pacific serves many of the fastest-growing U.S. population centers, operates from all major West Coast and Gulf Coast ports to eastern gateways, connects with Canada’s rail systems and is the only railroad serving all six major Mexico gateways. Union Pacific provides value to its roughly 10,000 customers by delivering products in a safe, reliable, fuel-efficient and environmentally responsible manner.